Criss performs his interpretation of Houdini's metamorphosis illusion. He also tries his attempt at comedy by dressing as a pregnant woman who gives birth to little people. To honor his father's memory, Criss attempts to levitate in the 800-degree light of the Luxor hotel. Famous people reveal their Top 10 favorite Mindfreak moments, including the Steamroller, Walk on Water, the Woodchipper, Penetrating a Window, Burned Alive and others. The creative process behind the illusions and demonstrations from conception to execution. It is centered on stunts and street magic acts by Criss Angel. Chronicling the a car-customizing shop in Corona, Cal., and their clients' project vehicles. 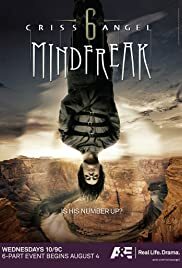 Q: What does the symbolism, the people and everything of the "Mindfreak" intro mean? The first time I saw this show, I said "wow, this guy is amazing." Then I realized that anyone with a video camera can do magic tricks. Don't get me wrong, this show is worth watching for the entertainment factor. Just remember that nobody can defy the laws of gravity, no matter how convincing he is. I would like to go see one of his shows live. He seems like a very good entertainer. However, when he says that he will leave something in one spot and then the camera cuts to a different angle, it makes you wonder if they touched anything. The reactions from the spectators often seem authentic, but for all we know they could be straight out of acting school. They all seem to be the same age. Plus the show is filmed in Vegas so who knows what kind of people they have there.